Hey Harriet! Help Me Get Out of This Prison, Please? There are things to chase out there! 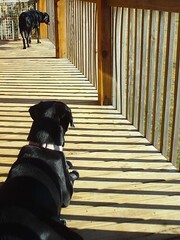 Tags: barkwells, black lab, clover and cosmo, hey harriet, Labrador Retrievers, shadow shot sunday, shadows, stripes. Bookmark the permalink. Aw! It does look kind of like a jail doesn’t it?? But it’s not really! We have one of those at our house, too. Hope you enjoy the rest of your weekend!! Patience and impatience? Great shadows. Labrajail. You only get out for good behavior. what a fantastic title for a lovely shot. I imagine a tickle behind the ears wouldn’t go astray. Great shadow shot, it really does look like a jail. Great shadow shot. Poor doggies in jail-HA. Haha…yeah, poor puppies…right. Is that Clover or Cosmo just enjoying the sun without pleading for more? Hi Lisa! That is Clover lying down, and Cosmo searching through the railing for a rabbit. Ha! I watched the video of them barking and they are so fun and adorable together. what lovely doggies you have. yours is a splendid shadow shot, I love all those lines broken up by the black coats of the dogs. nicely done! happy SSS, and have a great week! The shadow Shines Through, have a blessed Sunday! Your pups are such cuties! Clever shadow shot, too. Fantastic shadows and I love labs! As usual a playful post here that makes me chuckle! Thanks for a fun blog that is always worth visiting! Here’s to a great week ahead!